A great underlying theme dominating Western astronomy from Plato and the Greeks to the end of the Middle Ages and into the early Renaissance was a continuing and evolving struggle to represent observed planetary motions as combinations of uniform circular motions. Copernicus's De revolutionibus orbium caelestium (On the Revolutions of the Celestial Spheres) of 1543 is as full of epicycles and deferents as was Ptolemy's Almagest fourteen centuries earlier. Scholars have quibbled over who had more circles, Copernicus or Ptolemy, but no one denies a plethora of circles in each of their books. 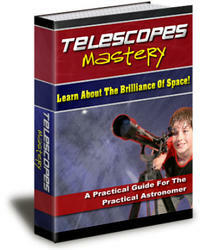 Copernican astronomy was the culmination of Greek geometrical astronomy and uniform circular motion. In what way, then, was Copernican astronomy a revolutionary departure from the astronomy that preceded it, if indeed it was? Thomas Kuhn has argued that De revolutionibus, while a revolution-making book, was not a revolutionary book. It was almost entirely within an ancient astronomical tradition. Yet it contained a few novelties that would lead to a scientific revolution unforeseen by its author. Another question, whether or not we label Copernicus a revolutionary, is what made him so dissatisfied with Ptolemy's planetary model that he was motivated to devise a new theory. In modern science, the usual suspect for the role of crucial anomaly resisting conformity with theory is a new observation. In Copernicus's time, however, no startling new astronomical observations refuted Ptolemaic astronomy. Nor did Copernicus's heliocentric system provide a better match between theory and observation than had Ptolemy's geocentric system. Copernicus, himself, acknowledged that Ptolemy's planetary theory was consistent with numerical data. What, then, demanded change? On what basis other than observation might one theory be judged better than its rival? To answer these questions, we must look to the paradigm or themata informing Copernicus about nature and how it behaved. His historical, cultural, and sociological settings—not least the education he received and the philosophical and aesthetic values he absorbed—are important facets of a history of Copernican astronomy. What were his underlying beliefs and worldviews—scientific and otherwise? Quasi-aesthetic choices based on them, not on observation, would guide Copernicus at critical junctions along his path toward change, possibly revolutionary change and certainly revolution-making change. Nicolaus Copernicus was born in 1473 in the city of Torun, where a major trade route crossed the Vistula River. The Teutonic Knights, a group of German military monks, had built a castle in Torun in the thirteenth century and ruled over the city. Seven centuries later, Nazi historians attempted to claim Copernicus for the glory of the Third Reich, even though the people of Torun had revolted against the Teutonic Knights in 1454 and Torun had become part of Poland, only to be annexed to Prussia in 1793 and reclaimed by Poland in 1918. Copernicus's father was a merchant and a leading citizen of Torun. Copernicus's mother came from an even more eminent and wealthy family. Her brother, Lucas Watzenrode, became guardian of Copernicus and his siblings in 1483, when Copernicus's father died. Watzenrode had attended Cracow University in Poland and the University of Bologna in Italy, where he studied church law. Probably in existence as early as the 1080s, and chartered by the Holy Roman Emperor Frederick Barbarossa in 1158, Bologna is the oldest continuing university in the Western world. Watzenrode obtained a position at Frombork (Frauenburg) Cathedral, built by the Teutonic Knights in the fourteenth century but under Polish influence since 1466. Watzenrode became both bishop and ruler of Warmia (Ermland), including the Cathedral church at Frombork. Warmia was a sort of vassal state of Poland, though the Teutonic Knights still owned much of its land. Squeezed uncomfortably between Poland and the Knights, the bishop's primary task was simply to survive. In 1491 Copernicus was admitted to the University of Cracow. The city, astride a major trade route from Europe to the East, was famous for its wealth and culture. The university, first chartered in 1364, was one of the first northern European schools to teach Renaissance humanism, which had originated in Italy. Astronomy at Cracow, however, still was taught largely in terms of Aristotelian physics. Several mathematics and astronomy books collected and annotated by Copernicus while he was at Cracow furnish evidence of his early interest in astronomy. Watzenrode intended to appoint Copernicus to a position at Frombork Cathedral after a few years at Cracow University. Waiting for the next open position, in 1496 Copernicus was sent to Bologna to study church law. The astronomy professor there, Domenico Novara, was one of the leaders in the revival of Platonic and Pythagorean thought and Greek geometrical astronomy, and we will find this intellectual heritage on prominent display half a century later in Copernicus's De revolutionibus. Teacher and student probably discussed Ptolemaic astronomy. Copernicus made observations, recording in his notebook the exact time that the Moon passed in front of a bright star. In 1497 Watzenrode appointed Copernicus a canon at Frombork Cathedral. Copernicus, however, remained in Italy for the great Jubilee of 1500, when pilgrims traveled to Rome to seek pardon for their sins. He returned to Frombork in 1501, only long enough to receive permission to complete his studies in Italy. It was not uncommon then to begin at one university and finish at another. This Copernicus did, completing his legal studies at the University of Padua in 1503. He chose to take the final examination and graduate at the University of Ferrara, perhaps to avoid the cost of a celebration for his many friends in Padua. Copernicus returned to Padua and studied medicine there before returning to Poland for good, probably early in 1506. During his first six years back in Poland, Copernicus, rather than taking up his duties at Frombork, waited on his uncle as medical attendant and also helped him govern Warmia. Copernicus administered taxes, dispensed justice, and traveled often on government business and as a diplomat. When Watzenrode died in 1512, Copernicus finally took up his long-delayed duties at Frombork Cathedral. The Teutonic Knights had built a fortified wall around the cathedral, and Copernicus lived in one of its towers. The tower opened onto the wall, from which Copernicus could make observations, and one of the first records of his stay at Frombork is an observation of the planet Mars. Observations, however, did not turn Copernicus into a revolutionary. In 1514 the pope convened a general council in Rome to study problems involving calendars, especially the date of Easter. Copernicus was invited but declined to attend, replying that before the calendar problem could be resolved the theory of the motions of the Sun and the Moon needed to be better known, and that he was working on this matter. If we insist on an explanation involving observation for the Copernican revolution, the calendar problem is the best bet. Anomaly led to a sense of crisis, which encouraged Copernicus to work on the problem, and his employer or patron (the Church) to allow him time for this important work. As much, however, as it may have motivated Copernicus to study astronomy and planetary motions, the calendar problem did not suggest to him any particular scientific solution. He might as well have attempted to improve Ptolemy's model as to replace it with a new theory. 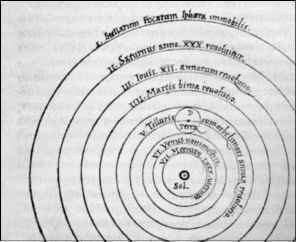 Instead, as we will find in Copernicus's own words, philosophical opinions and aesthetic values underlay his dissatisfaction with Ptolemy's planetary model and helped guide him toward a new theory. Around this same time, Copernicus was distributing handwritten copies of a sketch of his hypotheses of the heavenly motions. It is probably the manuscript of six sheets of paper expounding the theory that the Earth moves while the Sun stands still that was listed in 1514 by a Cracow professor cataloging his books. The Commentariolus (Little Commentary) soon disappeared from circulation, and wasn't published until 1878 after a handwritten copy was found in Vienna. Copernicus began by noting that ancient astronomers had assumed that heavenly bodies moved uniformly and had attempted to explain apparent motions by the principle of regularity. Callippus and Eudoxus had tried with concentric spheres but failed. Most scholars then accepted eccentrics and epicycles. Ptolemy's planetary theory was consistent with numerical data but contained equants: planets moved neither on a deferent nor about the center of an epicycle. To Copernicus: "A system of this sort seemed neither sufficiently absolute nor sufficiently pleasing to the mind" (Commentariolus, 57). What Copernicus meant by this will become more apparent in De revolutionibus. The point to be emphasized here is that Copernicus acknowledged agreement of Ptolemy's theory with observation but objected to Ptolemy's employment of the equant point on aesthetic or philosophical grounds—it was not pleasing to Copernicus's mind. He sought "a more reasonable arrangement of circles" in agreement with all observed apparent motions "and in which everything would move uniformly about its proper center" (Commentariolus, 47-48). In such an arrangement, the center of the Earth was not the center of the universe. Rather, all the spheres (except the Moon's) revolved about the Sun as their midpoint, and therefore the Sun was the center of the universe. Rotation of the Earth accounted for the apparent daily rotation of the stars; the apparent movements of the Sun were caused by the Earth revolving around the Sun; and the apparent retrograde motions of the planets were caused by the motion of the Earth. Copernicus concluded: "The motion of the Earth, alone, therefore, suffices to explain so many apparent inequalities in the heavens" (Commentariolus, 59). He provided sizes for orbits, their angles of inclinations, periods of revolution, and latitudes and longitudes for a few planetary alignments; but detailed mathematical demonstrations were reserved for his larger work. The calendar used in Copernicus's time was that dictated by Julius Caesar in the first century b.c. It was linked to the Sun rather than to the Moon. Its year was, and still is, 365 days long, with an extra day added to the month of February every fourth year. The actual length of the year, however, is about 11 minutes less than Caesar decreed. This works out to an error of one whole day every 128 years. The Church linked Easter not to the Sun but to the Moon. Easter occurs on the first Sunday after the first full moon on or after the vernal equinox. Translating a fixed date from a lunar calendar to a variable date in a solar calendar containing an error of several days over several centuries is not easy. Embarrassingly, the Church was unable to predetermine very far in advance the Julian date of Easter. The Gregorian calendar, based on computations using the Copernican system, was introduced in 1582 by Pope Gregory VIII. No longer is a leap day added to years divisible by 100, unless they are also divisible by 400. Thus 1900 was not a leap year, but 2000 was. circles around the central body, Copernicus's planetary model would evolve over the years between 1514 and 1543 into the complicated mathematical machinery of epicycles and deferents found in his De revolutionibus. One more assumption appeared in the Commentariolus. Copernicus stated that "the distance from the Earth to the Sun is imperceptible in comparison with the height of the firmament" (Commentariolus, 58). A universe vastly larger than the region of the Sun and Earth would be a major part of the Copernican revolution away from the closed medieval universe and the central position of human beings, but there is no hint of these matters here. Nor is there any hint of the future controversy over the absence of an observed stellar parallax, predicted from Copernicus's heliocentric theory but too small to detect were the stars at great distances from the Earth. Copernicus explored neither of these issues implicit in his new planetary model. In 1516 Copernicus was given the task of managing two outlying estates, and he moved to Allenstein Castle, about 50 miles from Frombork. War broke out between the Teutonic Knights and the Poles in 1519. During 1520, while the town of Frombork burned, Copernicus was safely behind the cathedral wall, with time to work on his book on a new system of the world. During 1521 he was besieged in Allenstein and again had time for astronomy. In the peace that followed, Copernicus was busily employed in repairing the damage from years of war. Many church officials had fled Warmia, and during 1523 Copernicus acted as administrator-general of the tiny country. Luther had initiated the Reformation early in the sixteenth century. He accused the papacy of departing from the teachings of the Bible and insisted that Church officials and their interpretations should not be allowed to come between believers and the Bible. Literal adherence to the Bible was thus the foundation of the Protestant revolt against Catholic religious hegemony, and Protestants consequently rejected metaphorical and allegorical interpretations. Therefore, it was Protestants, not Catholics, who initially found the heliocentric theory unacceptable, especially because of Joshua's command to the Earth to stand still (Joshua 10:13). Prior to the Counter Reformation, in whose tendrils Galileo would become entangled, the Catholic Church was more liberal in its interpretation of the Bible and thus more accepting of Copernican astronomy than were Protestants. Copernican astronomy would be taught in some Catholic universities and would be used for the new calendar promulgated by the pope in 1582. In 1539 a young German professor of mathematics, known as Rheticus, after his birthplace, Rhaetia, showed up at Frombork to learn more about Copernicus's system. It was a brave action. Rheticus could have found himself in disfavor with authorities back home at his Protestant university, or he might have been persecuted as a Protestant in Catholic Warmia. Copernicus, too, displayed courage, daring to host a heretic. Rheticus wrote a biography of Copernicus, unfortunately lost. Copernicus was almost finished with his De revolutionibus, and he generously shared it with Rheticus. In 1540 Rheticus sent to a printer the Narratio prima, or First Account, of part of Copernicus's theory. Rheticus may have planned a second account, and perhaps more, but he was forestalled by the publication of Copernicus's own book in 1543. Perhaps Copernicus was encouraged to publish by the favorable reception given Rheticus's Narratio prima. I t was necessary to abandon the hypotheses of the ancient astronomers, Rheticus wrote. The motion of the Earth could produce most of the apparent motions of the planets. Furthermore, only in the heliocentric theory "could all the circles in the universe be satisfactorily made to revolve uniformly and regularly about their own centers, and not about other centers—an essential property of circular motion" (Narratio prima, 137). Here he was criticizing equant points as a violation of uniform circular motion. Another point of criticism was that early planetary models were deficient in harmony (or unity or symmetry or interconnection). Ancient astronomers had fashioned their theories and devices for correcting the motion of the heavenly bodies with too little regard for the rule which reminds us that the order and motions of the heavenly spheres agree in an absolute system. . . . We should have wished them, in establishing the harmony of the motions, to imitate the musicians who, when one string has either tightened or loosened, with great care and skill regulate and adjust the tones of all the other strings, until all together produce the desired harmony, and no dissonance is heard in any. . . . Under the commonly accepted principles of astronomy, it could be seen that all the celestial phenomena conform to the mean motion of the Sun and that the entire harmony of the celestial motions is established and preserved under its control. . . .
. . . Hence the mean motion of the Sun would necessarily be perceived in all the motions and appearances of the other planets in a definite manner, as appears in each of them. Thus the assumption of the motion of the Earth on an eccentric provides a sure theory of celestial phenomena, in which no change should be made without at the same time re-establishing the entire system, as would be fitting . . . In Ptolemy's system, the parts were arbitrarily arranged. Theory for one planet's motion was independent of theories for other planets. In Copernicus's system, the parts had a natural and necessary order. Were one circle changed, all the others would have to be adjusted, too. Platonic and Pythagorean resonances are also sounded in Copernicus's De revolutionibus of 1543. De revolutionibus began with a prefatory letter to the pope. Copernicus was well aware that certain people, as soon as they hear that in this book about the Revolutions of the Spheres of the Universe I ascribe movement to the earthly globe, will cry out that, holding such views, I should at once be hissed off the stage. . . . Figure 14.1: Portrait of Copernicus. Woodcut by Tobias Stimmer, 1451. Stimmer also painted this portrait of Copernicus in his decoration for the famous astronomical clock in the Strasbourg Cathedral, and wrote that it was a true likeness from Copernicus's own self-portrait. 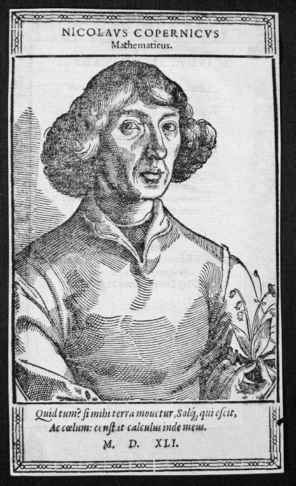 The lily of the valley in Copernicus's left hand is the standard icon for a medical doctor. Image copyright History of Science Collections, University of Oklahoma Libraries. The principal thing was the shape of the universe and the unchangeable symmetry of its parts. What Copernicus meant by this is not immediately evident. He promised "though my present assertions are obscure, they will be made clear in due course" (De revolutionibus, preface). It was customary early in the Renaissance to look to the past for knowledge. It was also typical to link orderly and good and assume that the universe was so constructed. Some ancient philosophers had supposed different motions of the spheres, according to the Roman writer Plutarch, whom Copernicus quoted: "Philolaus the Pythagorean says that she [the Earth] moves around the [central] fire on an oblique circle like the Sun and Moon. Heraclides of Pontus and Ecphantus the Pythagorean also make the Earth to move, not indeed through space but by rotating around her own center as a wheel on an axle from West to East" (De revolutionibus, preface). Copernicus concluded his prefatory letter to the pope with a wish that his labors might contribute to the Church, especially to reform of the ecclesiastical calendar. Even in his remote corner of the world, Copernicus wrote flatteringly, the pope was regarded as the most eminent by virtue of the dignity of his office and of his love of letters and science. By his influence the pope (so Copernicus hoped) might keep babblers who were ignorant of mathematics from pronouncing judgment against Copernicus by reason of scripture basely twisted to suit their purpose. 4. That the Motion of the Heavenly Bodies is Uniform, Circular, and Perpetual, or Composed of Circular Motions. We now note that the motion of heavenly bodies is circular. Rotation is natural to a sphere and by that very act is its shape expressed. . . .
Because there are a multitude of spheres, many motions occur. Most evident to sense is the diurnal rotation . . . marking day and night. By this motion the whole Universe, save Earth alone, is thought to glide from East to West. . . . But these bodies [the Sun, the Moon, and the five planets] exhibit various differences in their motions. First, their axes are not that of the diurnal rotation, but of the Zodiac, which is oblique thereto. Secondly, they do not move uniformly even in their own orbits; for are not Sun and Moon found now slower, now swifter in their courses? Further, at times the five planets become stationary at one point and another and even go backward [retrograde motion]. . . . Furthermore, sometimes they approach Earth, being then in Perigee, while at other times receding they are in Apogee. Nevertheless, despite these irregularities, we must conclude that the motions of these bodies are ever circular or compounded of circles. . . .
A similar passage might be found in Ptolemy, the phenomena explained with eccentrics and epicycles. 5. Whether Circular Motion belongs to the Earth; and concerning its position. Figure 14.2: Copernicus's Heliocentric Planetary Spheres, De revolutionibus, 1543. The Sun (Sol) is in the center, surrounded by the spheres of Mercury, Venus, Earth, Mars, Jupiter, Saturn, and the fixed stars. Our Moon's sphere carries it around the Earth (Terra). Image copyright History of Science Collections, University of Oklahoma Libraries. Copernicus's hypothesis did away, at least in principle, with any need for epicycles. Seemingly irregular planetary motions were instead attributed to the motion of the Earth around the Sun. In practice, though, Copernicus would be forced to use epicycles in order to save the phenomena. Indeed, he used a double epicycle for the Moon. However physically implausible the epicycle might be, it was not a violation of uniform circular motion. The equant was, and it was rejected by Copernicus for that reason. Several phenomena are more naturally explained in Copernicus's system than in Ptolemy's. One is that Venus and Mercury are always observed in approximately the same direction as the Sun (Venus is never more than 47 degrees from the Sun, Mercury never more than 20 degrees). This phenomenon occurs inevitably in the Copernican system. In the Ptolemaic system, however, starting positions and orbital speeds must be carefully adjusted to keep the inferior planets within limited angular separations from the Sun. Figure 14.3: Orbit of an Inferior Planet in the Ptolemaic and Copernican Systems. S is the Sun, E is the Earth, and P is an inferior planet (whose orbit around the Sun lies within the Earth's orbit around the Sun: either Mercury or Venus). In the Ptolemaic model on the left, the angular speeds around the Earth of the centers of the solar and planetary epicycles must be nearly matched to keep the planet and the Sun in approximately the same angular direction as seen from the Earth. The inferior planets are never observed at opposition and must not be allowed to appear at opposition in the model. In the Copernican model on the right, the inferior planet, P, as viewed from the Earth, E, is always seen at a small angle from the Sun, S (always within the angle defined by the two straight lines drawn from the Earth and encompassing the planet's orbit around the Sun). The inferior planets can never be at opposition (on the opposite side of the Earth from the Sun). Nothing further is required of the model builder to obtain this result; it is a natural, inherent, and inevitable consequence of the model. Figure 14.4: Distances from the Earth of a Superior Planet at Conjunction and Opposition in the Ptolemaic and Copernican Systems. E is Earth, S is the Sun, and P is a superior planet, whose orbit around the Sun lies outside Earth's orbit around the Sun. In the Ptolemaic model on the left, the speeds of the planet's and the Sun's deferents and epicycles must all be coordinated closely to ensure that the superior planet is closer to the Earth at opposition (in the opposite direction from the Sun) and farther at conjunction (in the same direction as the Sun). In the Copernican model on the right, the planet is naturally and inevitably closer to the Earth at opposition and farther from the Earth at conjunction. erably more difficulty, in Ptolemy's theory. Both theories saved the phenomena. Copernicus's theory did so in a more aesthetically-satisfying manner. Therefore Copernicus's theory might be favored over its rival, everything else being equal. But the observation that Mars, Jupiter, and Saturn are farthest from the Earth at conjunction and closest at opposition is not proof that the Earth moves. The correlation between a planet's distance from the Sun and its time of revolution around the Sun was pleasing to Copernicus; it evoked in him a sense of beauty. The missing appearance among the fixed stars is called stellar parallax. 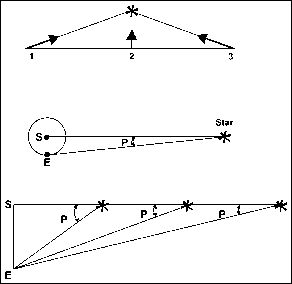 Because the Earth circles the Sun, an observer on the moving Earth observes a star from different places over the course of a year and consequently would see the star at different angles, except that the great distance of the star makes changes in the angle of direction too small to detect. Had Copernicus been concerned with the absence of parallax as a potential refutation of his heliocentric theory, we would applaud here a great spin doctor turning an argument on its head. More likely, Copernicus was oblivious to the negative implication of the absence of a detectable stellar parallax and genuinely enthused over its positive implication. How proper, fine, and godlike it was of the best and greatest artist to have arranged to have the greatest difference in distance between the moved Earth and other planets, and the unmoved firmament of the stars. Figure 14.5: Parallax. 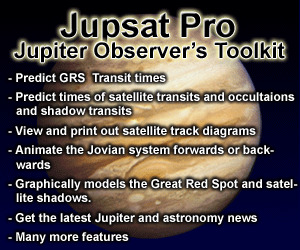 top: The difference in apparent direction of an object seen from different places. As an observer moves from 1 to 2 to 3, the angular direction of the object from the observer changes. First it is seen to the right; then straight up; then back to the left. Stellar Parallax. center: The angle subtended by the radius of the Earth's orbit at its distance from the star. S is the Sun, E the Earth, and P the parallax angle. In technical terminology, the parallax of an object is the angle that would be subtended by one astronomical unit (the mean distance of the Earth from the Sun) at the distance of the object from the Sun. Distance. bottom: Note that the parallax angle decreases with increasing distance of the star from the Earth. Needing to explain away the absence of any observed stellar parallax, Copernicans would argue that the great distances of the stars made any parallax angle too small to detect. Not until the 1830s, with instruments vastly better than the best in Copernicus's time, was stellar parallax first measured, by three different astronomers. The Scottish astronomer Thomas Henderson was the first to begin his measurements but the last to report them; Friedrich Struve at the Pulkovo Observatory, near St. Petersburg, was the first to publish positive results; and Friedrich Bessell, at the Königsberg Observatory, made the most convincing measurements. He measured a parallax of about a third of a second (60 seconds in one minute and 60 minutes in one degree) for the star 61 Cygni. The independent and practically simultaneous reports of the measurement of stellar parallax left little doubt that, after almost 300 years of searching and several false alarms, the stellar parallax predicted from Copernicus's heliocentric theory finally had been detected. Who proposed that celestial motion is circular and uniform?